I came away from Thruxton a few weeks ago with mixed feelings. 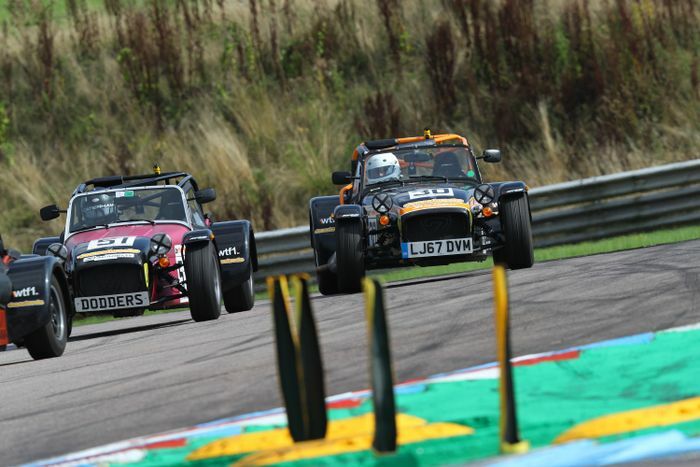 The fourth race and sixth round of the 2018 Car Throttle Caterham Academy was a race I’d actually - shock, horror - done a little preparation for, stumping up the fee for the Friday test sessions to get to grips with the UK’s fastest circuit, and to an extent, it had paid off. 14th in qualifying and 12th in the race - the latter made possible by a last lap move on Graham Dodridge after a lengthy battle - was my best result since Brands Hatch, but I’m certain I could have done better. I made a poor job of picking my way through traffic during the qualifying session and ended up about a second off my best time from the test day. That’s something I’m learning about racing - if you’re not careful, you find yourself looking for negatives even after a good result. But rather than fill this page with shoulda coulda woulda woe, I’m instead going to explore a side of my racing year I’ve not yet talked about: what happens to the car when it’s not race day. The vast majority of the Academy paddock turn up with their cars on trailers, and that makes sense. Some of the tracks on the calendar require a lengthy journey, particularly for anyone living further north (a few drivers have to make the long trip down from Scotland, even), and you do need to bring quite a lot with you in the way of tools and race gear. And biscuits. However, I don’t have a trailer, nor do I have a suitable car to hook a trailer up too. And in any case, I figured it’d make for a more interesting experience driving to every single race and sprint. I’ve gone further than that, though, by using my racing Caterham for daily driver duties. Because I’m weird. 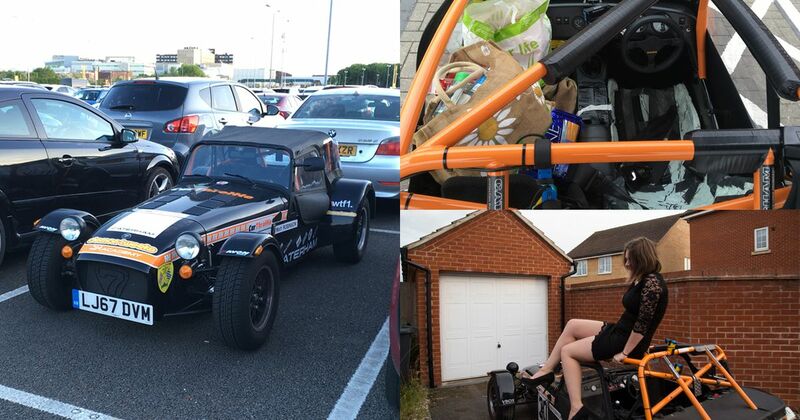 Two weeks of shopping in a Caterham Seven racing car? No problem! Most of these trips have required loading quite a lot of stuff into a car that doesn’t really have any luggage space. 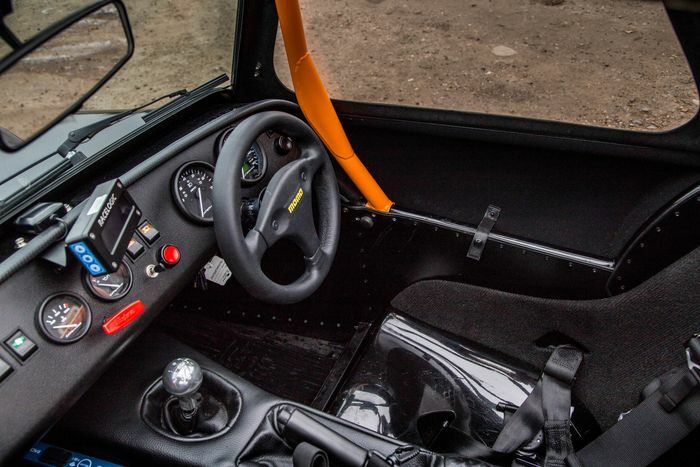 Sure, there’s something vaguely akin to a ‘boot’ at the back, but there’s not a lot of room back there, particularly in a race-spec Caterham with a ruddy great fire extinguisher eating a lot of room. Plus, the vinyl boot cover with its many poppers and ludicrously tight fit is a massive pain to undo and re-install. Your only feasible option is to use the passenger seat and footwell, but you’d be amazed what you can fit in there. It’s like playing Tetris, with added swearing and injury potential. On a race day I squeeze in a pair of axle stands, a trolley jack, a socket set, my race kit bag and helmet without fear of anything toppling into my groin region at the first corner I got to. Tom Power - one of only a handful of Academy drivers driving to every meeting this year - fits in all of the above plus a pop-up gazebo. And a folding chair. And a tent. He uses the ‘boot’ thing for some of that, but even so, I’m not entirely sure how the man manages it. 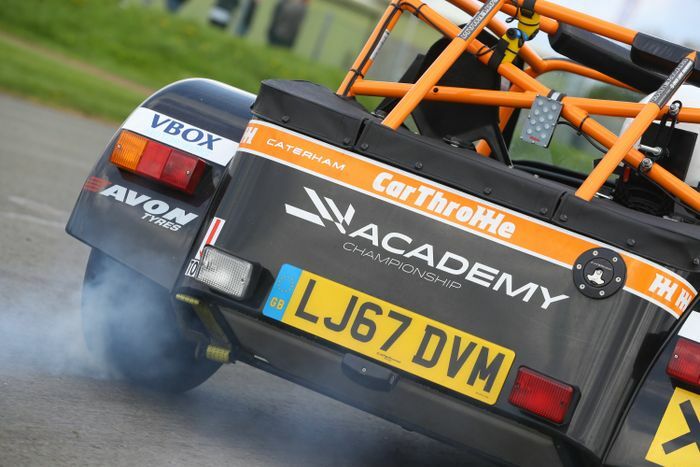 You’d think long distances in a racing car couldn’t be anything other than horrific, but that isn’t necessarily the case with a Caterham Academy Seven. The suspension setup is reasonably soft, and ‘my’ example has the benefit of a ‘bead seat’ which is molded to my lanky shape. This was done for the sake of the safety regulations - in the standard plastic seat (not as horrible to sit in as you’d expect) my head is too high, which would put me at extreme risk during a rollover crash. The bead seat - made from polystyrene set with a resin - sits me lower and reclines my back ever so slightly, keeping my noggin away from danger. But it also has the benefit of being fantastically comfortable. I did a seven-hour round trip to the Aintree sprint in one day, and although my feet did start to hurt a little, I didn’t get a whiff of backache. 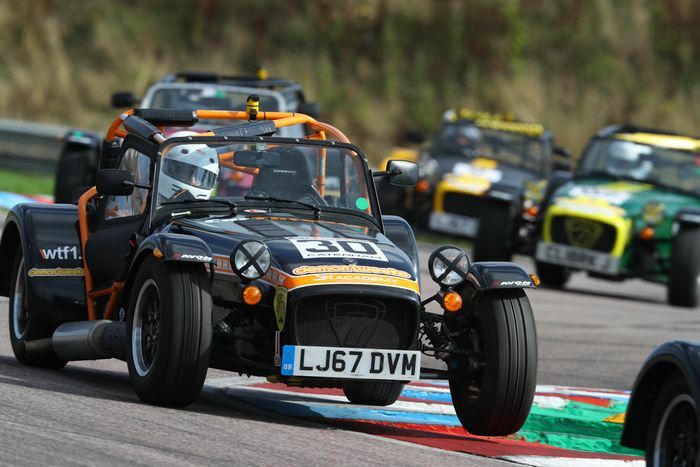 Wearing headphones while driving is something that’s normally advised against, but in the case of driving a Caterham long distances, noise-cancelling headphones are a must. Cutting out the constant drone of the engine and transmission not only stops you from going mad, it also means you’re going to be able to concentrate better on what’s going on around you. As I’ve said time and time again, there is no substitute for being on track as much as possible. But if you’re limited to how much you can do outside of race weekends, driving your car anywhere is helpful. You’re more used to the controls, getting in and out becomes second nature, and being in the thing just feels normal. The last thing you want is for your racing car to be an alien environment when you turn up for the event. A racing start is a tricky thing to get right. Too much gas, and you’ll be spinning up the rear wheels, going nowhere fast. Not enough, and you’ll bog down or worse - stall. While my performances during the races have been hit and miss, my race starts and sprint starts have mostly been pretty decent. I’d attribute that to all the road driving I’ve been doing. Whether you’re going for a swift getaway at the traffic lights, aiming for a gap in traffic to get onto a roundabout or just having a cheeky practice on a quiet back road, you’re applying the same principles as a race start. Recommended car throttle shop Worldwide Shipping In The CT Shop Car Throttle Submit Your Videos To Get Featured On Our Social Channels Blog The New CLA Coupe Is Odd, Even For Niche-Happy Mercedes Blog JLR’s Exciting New Inline-Six Is Better Late Than Never Blog Does The Up GTI Really Deserve Its Name? Blog Why Mazda Is The New BMW For Petrolheads Blog Why We're Revisiting The FK8 Honda Civic Type R Blog Why Is Ford Resurrecting The Defunct Puma Name On A Crossover? Blog 5 Cars You Wouldn't Expect To Share An Engine With The Nissan 350Z Blog I'm Living With A Mercedes-AMG C43 For Nine Months: What Do You Want To Know?